by gplhlTime to leave, say goodbye. Woke up this morning to a downpour. Mmm a whole day in the saddle in the rain. After checking the forecast it confirmed, rain all day. 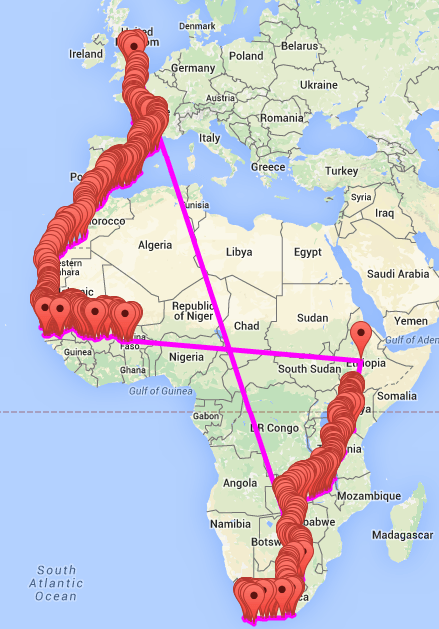 After saying my farewells and thanking my hosts I set off, unexpectedly not in the rain! 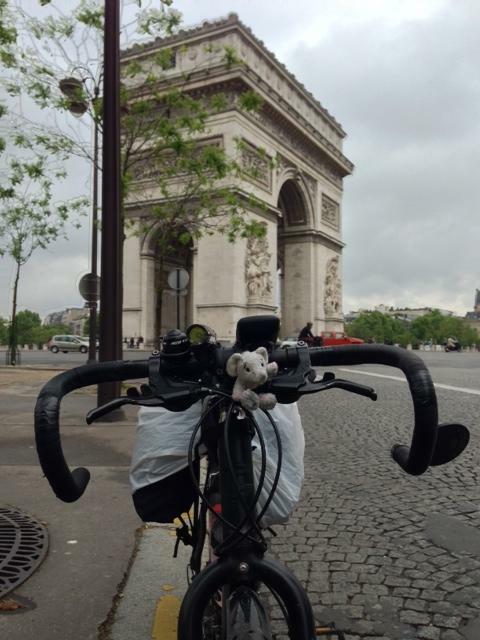 I slightly diverted my course to take in the Arc de Triomphe and headed out of Paris. The whole clip is 8 minutes. I’ve trimmed it to just the end. It was slow going due to heavy traffic, but once the traffic cleared bead out in open countryside where the headwind decided to say hello and take its turn in slowing me down. The rain decided to make an appearance a few times and only heavy once so I got off lightly. At one point I went past a building with a bright green pool in it and decided to take refuge for a few minutes and have something to eat. 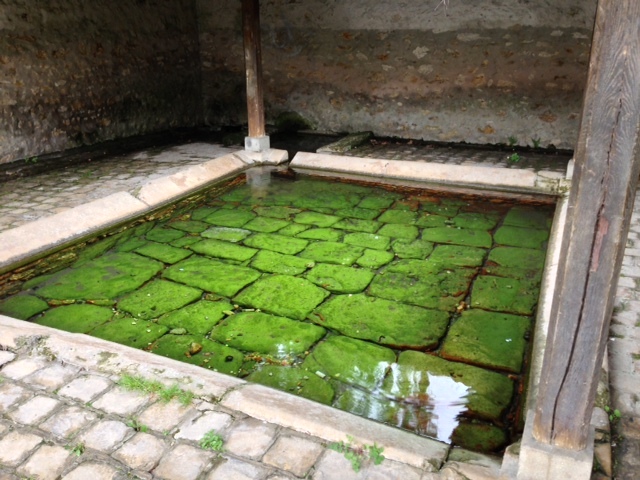 The picture shows the water which must be a spring as it was running out at one end. There were no lights in it, just an open roof to allow daylight in. It was awesome colours, green in the middle and red on the outsides. I came across the Avenue Verte a few times again and on the way to Rouen went through several villages in the opposite direction to last year. I detoured past a byway that came up on the Garmin and went through Romilly-Sur-Andille and came across this big bike so I had to stop and take a photo. While I was taking the photo, three identically clad French riders flew by to go up the big hill that went off to the right. I followed five minutes later after I finished faffing with the camera. What a hill, a few switchbacks and beautiful Smoooothhh Tarmac. It must be a well known climb in the area as it had signs all the way up showing how many metres you had gone since the bottom. I.e “2800 Metres Parcourse” and each sign had a cyclist on the left. I’d love to come back to this one without Panniers on! 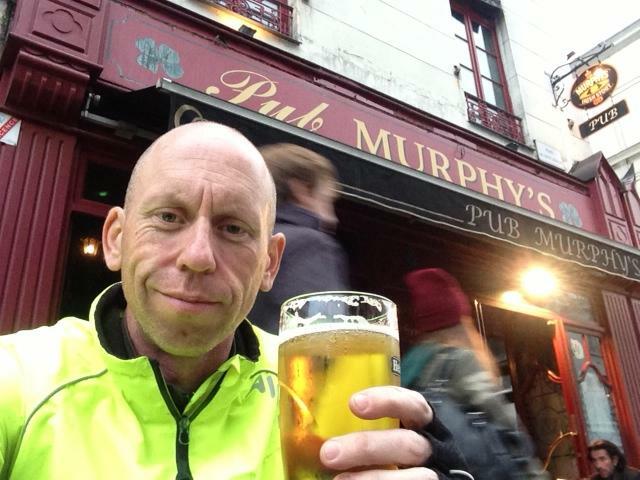 As I’m writing this in an Irish bar and my rides not yet finished I haven’t uploaded to Strava yet, I’m looking forward to seeing if its a section, I can’t believe its not.. And Simon/John if you read this, it’s on the Bad Boy with CX tyres, mudguards, Luggage and Panniers!!!! 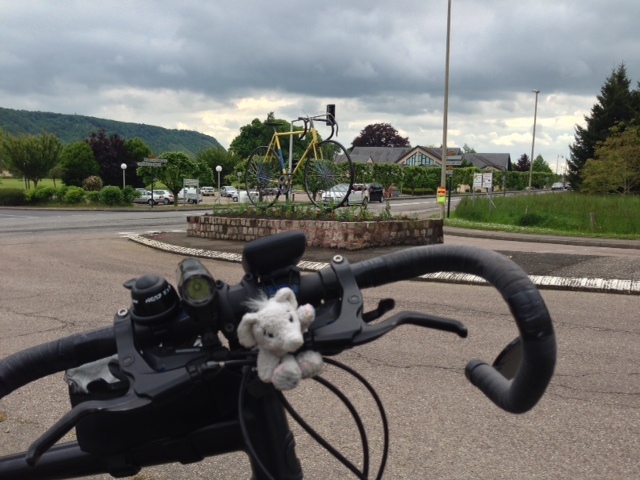 oh and an elephant on the handlebars  think the beers kicking in..
My hosts tonight Catherine and Clair aren’t home until 10pm so I’ve dropped my bags off at the house, serviced the disc brakes and come back to Rouen for a bit of touristy stuff. Keep getting odd looks in cycle shorts, high viz jacket and leg warmers. The French DON’T WEAR HIGH VIZ it’s not cool!! I had a discussion with Claire on this subject the other day. I’d rather be uncool and alive than cool in a coffin!